Home picture of the day Do Black Holes Matter? 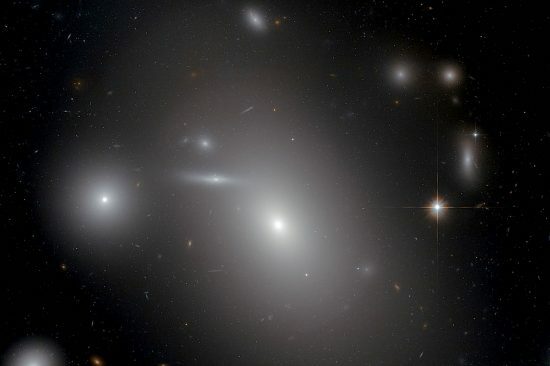 NGC 4889 (center) is thought to be home to a supermassive black hole 21 billion times the size of the Sun, with an event horizon 130 billion kilometers in diameter. The bright cross-shape is a foreground star in the Milky Way. Credit: NASA/ESA. There is supposed to be a supermassive black hole in the core of the Milky Way that is tearing stars apart. Black holes cannot be directly seen, but astrophysicists continue to maintain that they exist because of their putative effects. They assume that matter can accelerate and compress until it is “spaghettified”, or stretched, whereupon it is torn apart and reconfigured by intense gravity fields. Almost all (more than 95%) of galaxies are thought by astronomers to be home to one or more black holes. Since matter spins around a black hole at extreme velocities, consensus opinions state that it heats up from friction, generating X-rays and ultraviolet light. It is those emissions that are interpreted as indirect evidence for black holes. Previous Pictures of the Day take issue with that model. The terminology, itself, is highly speculative and ambiguous. To say that X-rays and ultraviolet light are created in gravity fields is to betray an ignorance. Experiments in the laboratory create those energies by accelerating charged particles in an electric field. There is no experiment that can provide evidence for matter collapsed to “near infinite density”. Rather, Bennet pinches (z-pinches) in plasma-state material form plasmoids. When the electric flux inside double layers within galactic circuits gets too high, there is a sudden “short circuit” that draws energy from the surrounding space. That energy could be concentrated from hundreds of cubic light years and then discharged in a burst of cosmic lightning, generating X-rays or flares of ultraviolet light. Instead of a black hole, X-ray radiation from a plasmoid in the Milky Way’s heart is a charged particle accelerator, so electrons spiral in the electromagnetic fields and give off X-rays. The diffuse currents then flow out of the poles and back toward the galaxy’s equatorial plane, spiraling back toward the core. Black holes are the subject of many previous Picture of the Day articles. The short story, from an Electric Universe perspective, is that black holes are a misperception. The descriptive terminology used by researchers is problematic, relying on loose interpretations. Ambiguous lexical labels such as space/time, singularities, infinite density, and other non-quantifiable ideas, make what should be realistic investigations into a kind of irony. Using the concept of infinity is all over the work on black holes: infinitely weak gravity is compared to infinitely dense black holes. Such ideas mask the fact that no scientist understands gravity, or how mass is expressed by matter, or how matter expresses gravity. They especially ignore the Electric Universe. Since stars are plasma phenomena, they are governed by electricity and not by gravity, alone. Since stars are loads in an externally powered circuit, a drop in circuit power means a drop in output, so a star will disappear—it enters a dark mode state. Variations in electric power mean variations in how a star behaves. Astronomers believe gravity is their only tool, and, in their world, no force can stop the collapse of any mass great enough to form a black hole. However, gravity’s effect is so small that it is effectively non-existent when compared to the electric force. It is charge separation that holds stars together, preventing their collapse. Even thermonuclear fires are not needed for a star to “live”. The standard model of stars fails because gravity is the wrong tool.